Enrole was designed to be intuitive and easy to use, however to be most effective, users should be familiar with its vast capabilities. In order to best understand how the software works, 3 days of on-site training with two trainers are provided with every Enrole implementation. 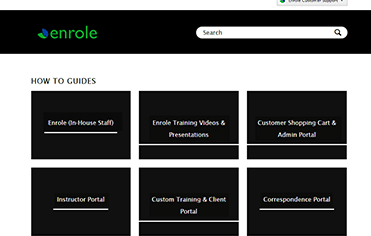 After training, you will have access to our knowledge center, which offers 24/7 self-service information including how-to guides, articles and training videos. Entrinsik hosts a user conference every 18-24 months. Our next conference will be held on September 23-25, 2020 in Raleigh, NC. We encourage all clients to attend the training sessions, meet their project managers, customer support team and mingle with other like-minded clients to share experiences and take part in presentations to show how they use our system. Training assistance can often be a great way to ensure employees are getting the most out of the software. Maybe you just had a large turnaround of staff? Entrinsik offers a host of training services to boost user adoption and increase work productivity – helping your team succeed. Content for additional training is designed to suit your requirements. Training can be done online or on-site, depending on your time constraints and budget.